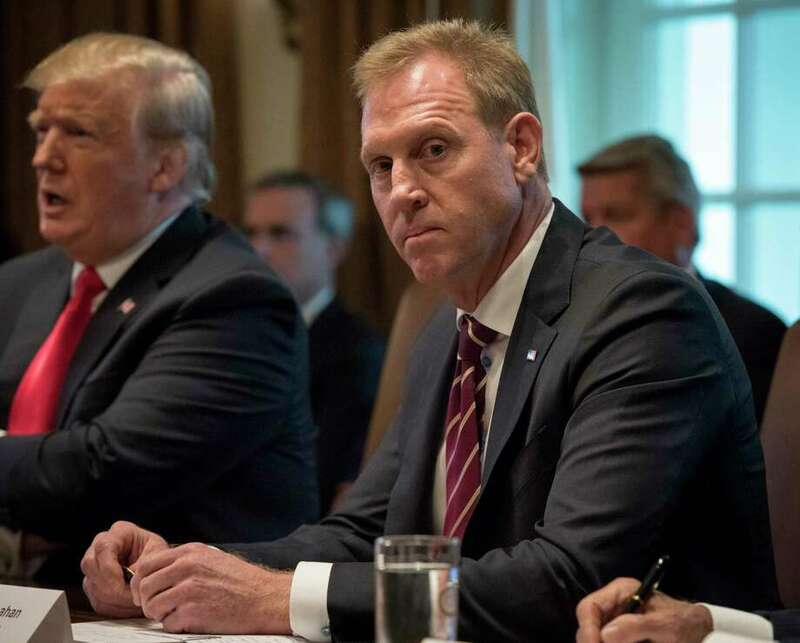 Acting Secretary of Defense Patrick Shanahan listens during President Donald Trump's Cabinet meeting Jan., 02, 2019 in Washington, D.C.
BAGHDAD - Acting defense secretary Patrick Shanahan made his first visit to Iraq on Tuesday to discuss the U.S. military's future in the country in the wake of comments from President Donald Trump that jeopardized plans for an ongoing counterterrorism presence. Shanahan, a longtime Boeing executive who was tapped to lead the Pentagon in December following predecessor Jim Mattis's sudden resignation, was expected to meet with Prime Minister Adel Abdul-Mahdi and other Iraqi and S. officials. Pentagon officials have been considering shifting some American troops from Syria into Iraq after Trump's unexpected December announcement that he would withdraw all 2,000 U.S. service members there. There are about 5,000 U.S. troops next door in Iraq, supporting local forces as they seek to ensure that remaining Islamic State cells cannot stage another full-fledged insurgency. Shanahan's brief stop in Iraq follows a one-night visit to Afghanistan and takes place as the White House considers nominating him to become Trump's second defense secretary. The selection of Shanahan, who has served as deputy Pentagon chief since mid-2017, would be a shift, given that he is an industry veteran and relative newcomer to military policy. He is the first person since the Sept. 11, 2001, attacks who had not visited either Iraq or Afghanistan, the countries whose counterinsurgency wars have consumed the military's attention for nearly two decades, before taking over at the Pentagon. His talks in Baghdad follow a political outcry generated by Trump's recent suggestion that he might keep a military presence in Iraq to "watch Iran," his administration's chief adversary in the Middle East. "We might as well keep it. And one of the reasons I want to keep it is because I want to be looking a little bit at Iran, because Iran is a real problem," Trump said in an interview with CBS. The characterization, which differed from what had previously been described as a plan to keep U.S. troops there to guard against the Islamic State's resurgence, intensified controversy about the American military presence and prompted some Iraqi politicians to seek passage of legislation that would limit Washington's role. In December, Trump's unannounced visit to American forces in western Iraq turned the issue into a national obsession. Iraqis from both side of the political aisle were aghast that Trump had gone to Iraq and not met with the country's leadership, saying it was an affront to Iraq's sovereignty. Trump's more recent comments drew fresh calls for the expulsion of American forces and condemnation from Iraq's top Shiite cleric along with Iraqi President Barham Salih and former prime minister Haider al-Abadi. Both men are considered close allies by Washington. Speaking to reporters before his arrival, Shanahan said the primary goal of his talks in Baghdad was to hear directly from Iraqi leaders. "We are in Iraq at the invitation of the government. And our interests are to build Iraqi security capability," he said. A portion of Iraq's army, built from the ground up following the George W. Bush administration's 2003 invasion, collapsed in 2014 in the face of an Islamic State onslaught. "Risk can be high and risk can be low. So I think people's concerns is just over the course of history they've seen how difficult it is to eradicate terrorism," he said. "The follow-on, the support and security . . . that will be an important part of the discussions [in Europe]."